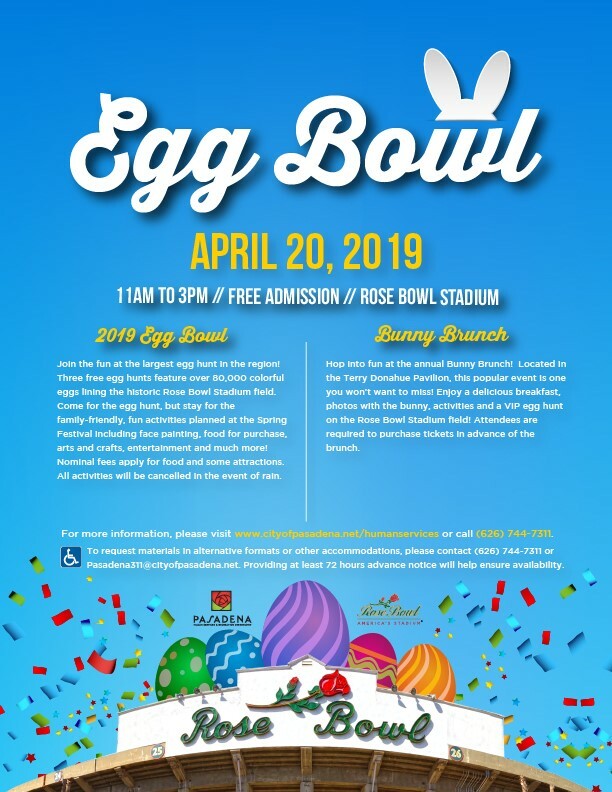 80,000 eggs inside Rose Bowl Stadium! 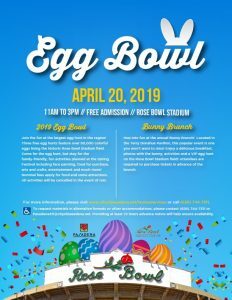 Celebrate spring by hopping your way through Pasadena’s Egg Bowl and Festival. Admission to the Egg Bowl and egg hunts is free. Come have an EGG-CELLENT time at our spring festival and enjoy fun for the whole family with games and activities such as face painting, live entertainment, food, pictures with the Bunny, and much more! Families can enjoy a memorable experience as children hip-hop their way onto the world famous Rose Bowl field. Egg hunts and festival are scheduled from 11:00 a.m.-3:00 p.m. Nominal fees apply and all activities will be canceled in the event of rain. The egg-citement will begin with a special Bunny Brunch in the Terry Donahue Pavilion, Stadium Club Lounge. Take photos with the bunny, participate in an exclusive egg hunt before the event opens to the public, enjoy pancakes, eggs, sausages and more. The Bunny Brunch fees will be posted on the website.